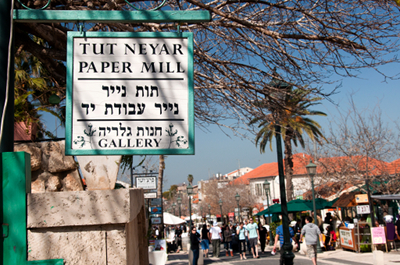 Tut Neyar is located in Zichron Yaakov, Israel, a rural location. A few days ago I celebrated my 46th birthday. Today I will redeem a present: a coupon to a paper workshop in a paper mill just 3 miles north of my house. as I leave my house, the morning sun is hot on my face, while the cold winter wind gently chills it. The place, simply called Tut Neyar, was founded by Izhar and Timna, and is in their backyard. 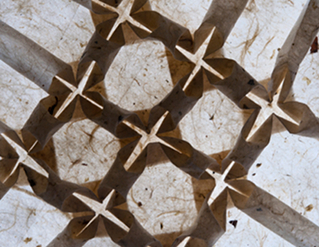 Izhar is one of the only paper makers in the west who goes through the process of paper making from start to finish: from raising the trees to making lampshades out of his handmade paper. Izhar studied in Japan 30 years ago to then establish this unique place here. And this is where I will be his apprentice for the day. An old Kozo tree is giving shade to the small workshop area. Izhar and Timna grow Paper Mulberry trees. They're called Kozo in Japanese, or Tut Neyar in Hebrew. Mulberry is mostly used for making paper, as it has long, strong and flexible fibers. 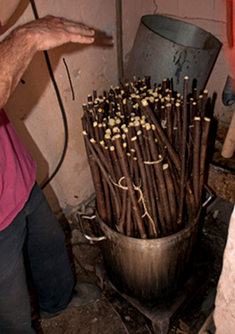 Izhar has around 500 trees, produce about 220 pounds of white pulp every year, enough material to produce about 200 pounds of paper. The trees grow in various orchards in the area. 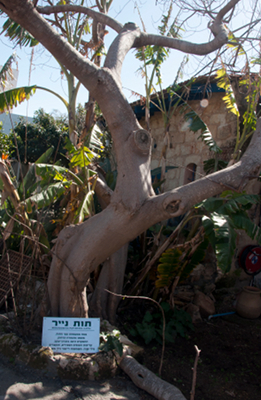 The most unique of these is an orchard by a vineyard located in the Galil mountains. You may wonder why some of the trees are grown so far away. The answer lies with the vineyard's owner: he wants to have his wine labels made from trees that are grown in the same soil as his grapes! 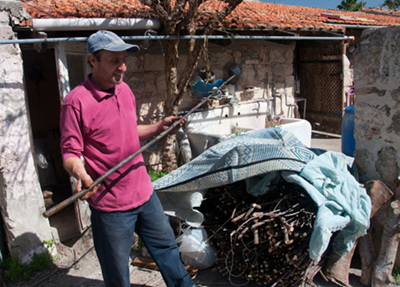 Izhar is holding a young and long branch, which are perfect for paper making. The Paper Mulberry trees are grown as bushes by cutting them to the ground level every year. This allows them to grow in straight, thin branches over the course of the next year. The first stage in making paper is to choose the right branches from the trees. There is a balance between thickness and usefulness with the branches. A thick branch brings a lot of bark. But if it is too thick, it will be woody, and will not deliver the delicate fibers we are looking for. After cutting the branches, they are steamed in a boiler for a few hours. The steaming loosens the bark from the branch, so that we can easily peel it off. When I arrive at Tut Neyar, the branches have already been treated in this way. Steaming the branches takes a few hours. 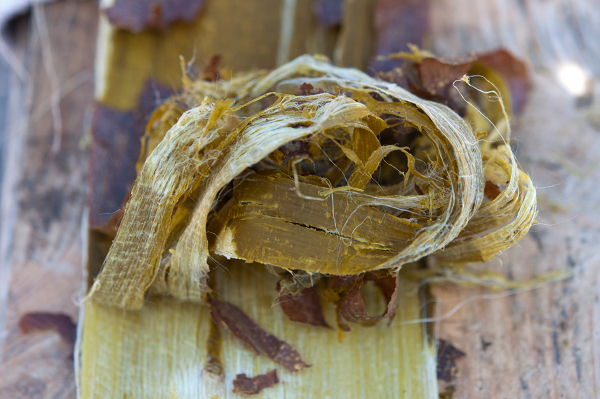 The bark shrinks during the steaming process. And this is the moment my hands get dirty. The bark is made from 3 layers. The outermost layer is brownish, the second layer is green in color, and the final one is white (with a slight green tint). Using a knife, we peel the green and brown layers from the white one. We will only work with the white layer, the other two are discarded. 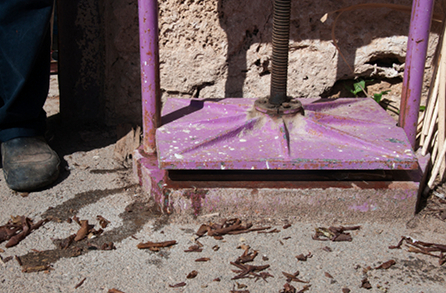 We now need to rinse the white layer in rain water, which is collected in big barrels under the roof drainpipes. 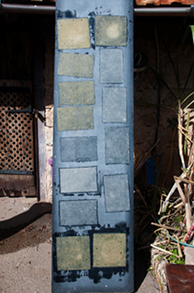 Rain water is very soft, which helps whiten the final product. This process of cleaning the bark is called chiri-tori. The white layer has a slightly greenish tint. Left to dry after the cleaning. 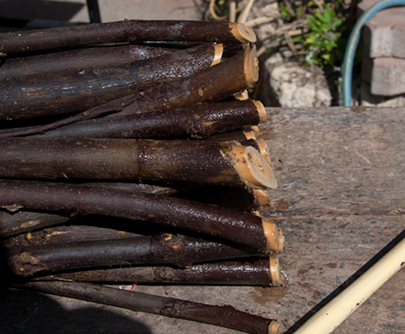 Now the bark has to be boiled in water and soda carbonate to remove the lignin. Lignin is the material that causes paper to get a yellow tint when exposed to oxygen over time. Historically, instead of adding soda carbonate, the water was infused with ash for several days. After straining the water it could then be used to boil the bark in. Nowadays, adding soda carbonate directly is much simpler and faster. After boiling the bark, it is cleaned in a tub. Next we will break the mixture into fibers. For this we hammer the bark to create the pulp. Both the hammer and the surface are made of wood. By hammering we can ensure that the fibers are separated from each other without being broken and shortened. The fibers are hollow and it's hard to spread them smoothly on a surface. It's somewhat like when you throw jackstraws on the floor. But after beating the fibers, they are flattened and behave more like a bundle of wet straps. It will be much easier to make a sheet of strong paper with them. 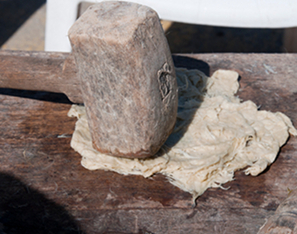 Beating the fibers using a wooden hammer on a wooden table. A cloud in a jar. 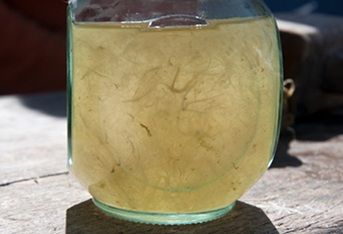 To check whether the fibers are all separated, we take a small handful of beaten pulp and put it in a jar of water. After shaking it we then check the mixture. If it is homogenous, like a fluffy cloud caught in a glass, the fibers are ready for the next step. If not, the fibers need to be beaten a bit more. Once the mixture is ready, it is piled into a vat. Using a hose that releases water under a high pressure the vat is then filled. It's important to ensure that we produce a homogenous mixture, which we need for the last stage. The process up until now concentrated on dividing the bark into its tiniest segments. 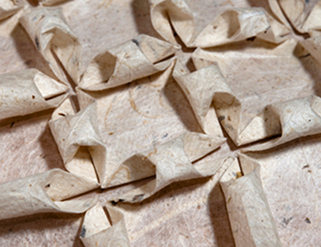 With that done we can now shape those segments into paper. While preparing the pulp takes hours, or even days, putting it all together to get a sheet of paper takes mere seconds. In these seconds the quality of the paper with all its properties – such as strength, thickness, and fiber direction – are set. The crucial moment that fixes all the paper's properties - spreading the pulp on the net. The screen I use is a wooden frame onto which a net is stretched. I first have to insert the screen into the vat to collect water and pulp. Next I shake the screen gently, moving forward and backward, left and right. At the same time, I try to hold the screen as horizontal as possible throughout. Once all the water has drained, I take a deep breath. 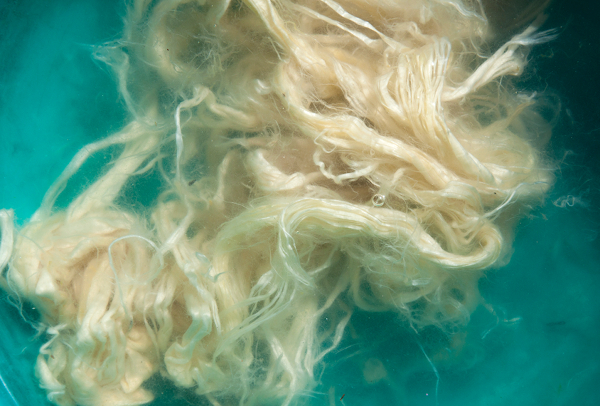 A soft layer of yellowish pulp covers the net. And I now have to turn it upside down on top of another net, which lies on a piece of felt. Flipping over the wooden frame correctly requires a lot of skill. You have to do it promptly and firmly. If you don't, ripples and bubbles of air will form, which ruins the paper. Thankfully, if that happens, you can simply recycle the pulp. Put the screen and the pulp back into the vet and give it another go. And sure enough, that's what I do on my first attempt. My second attempt is a success. Once the mixture is more diluted, you have to make two layers for each sheet. That's already the case after my third sheet. Finally, we need to dry the sheets of paper. First we squeeze out all the excess water with a screw press. 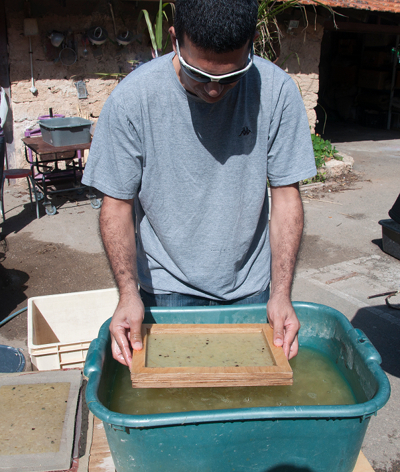 Then we put the sheets on a flat board, so that they can dry completely in the sun. Even in mid winter, one hour in the Israeli sun is enough to dry the paper. An hour later I hold in my hands 10 sheets of cream-color handmade Kozo paper. It is time to check the quality of paper I have made. I decide to fold my Red Flower Tessellation from the paper, and I am very happy with the results. The texture is very defined. One side is flat and smooth, because it was attached to a flat surface when it dried. The other side is rough. 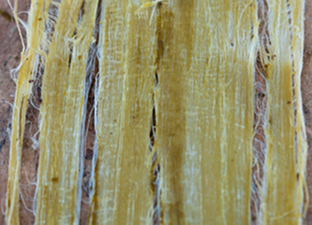 The fibers are clearly visible, parts of the bark are in the paper. This could be avoided by working more neatly in the chiri-tori phase, where the pulp is cleaned. 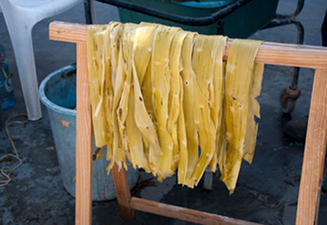 As the fibers are very long and they are spread in all directions, the paper is very strong. It also has a good memory and is easy to reverse-fold. Back-lighting the model emphasizes the fibers, which looks just fabulous! And it's a great way to finish the day. What a great experience it has been to improve my understanding of paper and how it is made - and give it a try myself. The front of my Red Flower Tessellation shows the rougher side of the paper. The sun that dried the paper is backlighting it!